Also available in 650b sizes. This is the first tubeless tire I have ever used and I was hesitant after reading of all the issues others had getting a tubeless tire to seat. I also was worried about the mess. 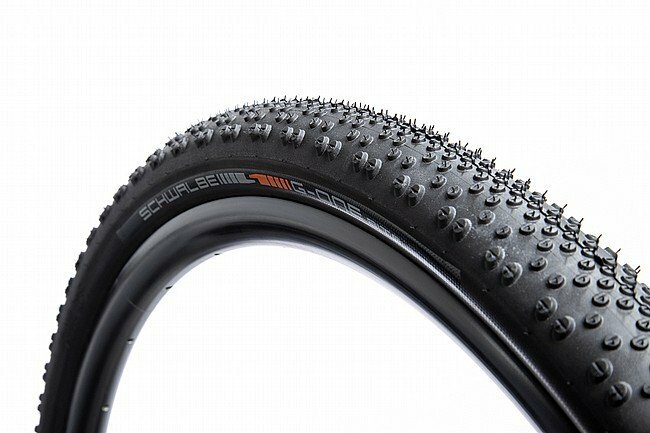 When Schwalbe labels this tire as Tubeless Easy they are not kidding. Mounting the tires was no more difficult than a regular clincher, no struggle at all. I was able to pump up this tire tubeless with a regular Silca floor pump. I installed the sealant through the valve stem with no mess. No sealant leaked from the bead and the tire is holding air. Easy to work with and great riding tire. I've used the G-One tire for a while, intermittently as I've tried other tires in between. I'm a heavier rider, so I've had a problem with tubeless and rear tire cuts (G-One and several other brands and models) on certain types of gravel. I was also never a fan of the G-One not having any real cornering traction. When this new G-One Bite came out, I figured I'd give this G-One variant a try. I've been riding this tire for over a month now with no flats. I've got a race and several hundred miles on them. The 38's seem to have nice volume. Much better cornering traction, doesn't seem like much is lost on the speed front.. and best of all, NO TEARS! Functionally I'm giving these 5 stars, because I have no complaints. This will be my go2 tire for now. I did give the tire a low value rating. Lets face it, these are great but when bicycle tires cost almost as much car tires thats a bit of a stretch. So yea, they are pricey. But... I'd rather spend up on tires than spend on CO2 and tubes. Worse yet, have to blow $100 on an Uber when I'm 50 miles in the middle of no-mans land and need an emergency lift home because I destroyed another rear tire and can't patch it.